ajivikas............................... . First Indian philosophers to face squarely the philosophical problem of determinism and free will. ambhas............................... . Conception of water. Amrapali.............................. . Amrapali, a prostitute, gave a gift of a mango grove to the Buddhist community in conjunction with her conversion to Buddhism. See also Mary, Martha and Amra--Buddhist sources of Luke 10:38-42. Ananda................................ . Buddha's chief disciple and faithful companion for forty years. apsara................................. . celestial being.aranya................................. . Forest. arhats.................................. . Worthy beings, saints. Arthasastra........................... . An ancient Indian treatise on state craft and kingship. arupa-loka............................ . The Immaterial World. Arya.................................... . The word occurs in both the Iranian Avestan and Vedic Sanskrit texts, was given a racial connotation, as referring to the race of Aryans. asat..................................... . Conception of non-existence, non-being. asavakkhaya-nana.................. . Knowledge of the waning influxes. ashraf (Persian)...................... . High caste Muslims claiming foreign descent. Asoka-vadana......................... . Legends of King Asoka. asrama.................................. . Hermitage.asthi (Sanskrit)........................ . Bones. atman................................... . A permanent self that transmigrates through samsara, (the Buddha, however, will reject this idea of a permanent self). bali...................................... . A kind of tax. bhaga................................... . A kind of tax. Bhagavad-Gita........................ . Important Hindu scripture.bhagavant.............................. . Blessed One. 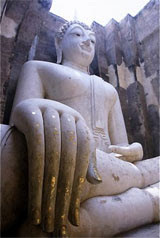 bhikkhuni............................... . Female monks, or nuns. bhumisparsha mudra................ . The ‘earth touching gesture’. bodhi.................................... . The state of perfect omniscience; tree of enlightenment. ........................... . Buddhas-to-be.Brahman................................ . The abstract divine principle underlying all of existence. Brahmin................................. . The highest Vedic caste. Buddha.................................. . The Awakened One. Buddha Maitreya...................... . The next Buddha. Buddhacarita........................... . Asvaghosa, written several hundred years after Buddha’s death, a 1st century biography of Buddha. Buddhaghosa........................... . ‘Voice of the Buddha,’ Philosopher. cakravartin, chakravartin, cakkavatti............... . Universal ruler. Carvakas, Lokasyatikas, Barhaspatyas............. . Materialists were known by different names. cetiya; caitya (Sanskrit).................Shrines or memorials. Daksinapatha..........................The Southern Route, largely the Yadava trail from the Gangetic settlements to Avanti (Malwa) and Gujarat, a much-traveled link giving access to the ports of the west coast and the peninsula. dasa.....................................The lowest caste, included in the sudra caste. sutta, sutra (Sanskrit)................."The sutra of the turning of the wheel of dharma” is Buddha’s first sermon. The Buddha preached that the truth he has discovered is a middle path between extremes. At one end of the spectrum is severe asceticism that amounts to, essentially, self-torture. At the other end is sexual and sensual indulgence, which simply leads to more grasping and, therefore, more suffering. The middle path, he says, leads to self-knowledge, equanimity, awakening, and, ultimately, salvation (nirvana). He then lays out what is really the doctrinal foundation of Buddhism, the Four Noble Truths. Dhatukacetiya......................See Saririkaceity: bodily relic shrines. drona stupas.......................The eight stupas in which the Buddha’s remains were enshrined after they were divided. dvija.................................‘twice born’ (once physically, a second time through initiation rites). Evam me sutam, evam maya srutam (Sanskrit)..............‘Thus have I heard.’ Ananda, who was the constant companion of the Buddha, is said to have heard each of his master’s dharma talks firsthand, and so each of these texts begins with the standard Pali phrase evam me sutam. gana-sangha..................... .‘government by discussion’, or republic. grama-dharma..................Customary law of the village. Isipatana.........................The Deer Park in Isipatana (modern Sarnath), where Buddha preached his first sermon on the dharma. janapada.........................Clan territories (literally ‘clan-feet’ or clan footprint). Janma-bhumi...................The location of the exact place where Krsna and Rama were born. Kala...............................Time, from kal, to calculate. kama-loka......................The Sensuous World. Devas Wielding Power over the Creation of Others. karma, kamma................A word that literally means ‘action,’ but which comes in the Upanishads—and Buddhism as well—to refer to any intentional action that creates consequences or is performed with the anticipation of results, including, therefore, sacrificial action (which is, after all, fundamentally intended to create, to bear fruit). On its most basic level, karma is the natural law of cause and effect, inherent in the very structure of the world, a cumulative system in which good acts produce good results, and bad acts, bad results. Beings are then reborn in good or bad realms, depending on their cumulative karma in each birth. Karma is frequently described in Buddhist texts as being a seed, or phalam, which will eventually grow fruit, the quality and abundance of which is, naturally, dependent on what sort of seed was sown. katha................................Cycles of stories generally involving heroes. kiriya................................Action, the central conception of Jainism. Mahabharata......................First of the great Sanskrit epics, the second being the Ramayana. Their core narratives seem to relate to events from a period prior to all but the Rig Veda. The Pandava heroes of the Mahabharata (Yudhisthira, Bhima, Arjuna, Draupadi, etc), like their counterparts in the Ramayana (Rama, Sita and Lakshamana), are initially denied ‘kingdoms’ which would seem to be theirs by birthright and are forced into exile. Primogeniture evidently influenced succession and there are hints about the divine sanction of kingship; both of these ideas would become cardinal features of later monarchies. By the time of the Mahabharata the Aryans had evidently reached the upper Ganga, for there stood Hastinapura, the story’s disputed capital. Surviving versions of the Mahabharata would have us believe that the Pandavas and their Kaurava rivals were not only far from primitive but that they already monopolized the resources of the subcontinent. When not in exile, they are described as living in pillared pavilions and marble halls, their interiors opulently furnished and their floors so highly polished that visitors hitched up their robes in the belief that across such glimmering expanses they must needs wade. In reality, the core geography of the Mahabharata is limited to a small area of the Ganga-Jamuna Doab which was the maximum extent of Kuru territory. Lord Krishna, the scion and hero of the Yadava lineage, is worked into the epic as the Pandava’s mentor and guardian. mahaparinirvana................The death of the Buddha. Mara..............................Mara stands in Buddhist literature and art as the embodiment of temptations of all kinds, fear, delusion, and death, a being who would, as Buddhism became established, become perhaps the most well know emblem of dukkha. First, Mara attempted to plant doubt in Buddha’s mind, and then sent his ten armies—an array of demons who represented the basis for illusion and grasping in the world, as well as hunger, thirst, craving, sexual desire, sloth, fear, and so on. Buddha defeated them simply by recognizing them for what they were. In later versions of the story, Mara then unleashed his daughters, lustful and voluptuous temptresses, in whom Buddha showed not even the slightest interest. Finally, Mara challenged Buddha’s very right to enlightenment—if he was who he said he was, then who in the cosmos could prove this? Buddha reached out with his hand, as he was meditating, and touched the earth (bhumisparsha mudra), at which point the goddess of the earth bore witness to his right to the throne of enlightenment by creating a tremendous rumbling and shaking, and by making an ocean flow from her hair. Mara, terrified at this awesome display—and realizing that Buddha was indeed about to realize his goal, was indeed about to conquer death—gathered his armies of illusion and lust, and fled, thoroughly defeated. This term, magga or marga, was, according to Zacharias P. Thundy, absorbed into Christianity as the WAY, as in Jesus's expression in the Fourth Gospel: "I am the Way, the Truth, and the Life," and as in the Acts' reference to the Jesus Movement as the WAY (he hodos). Remarkably, the Greek word seems to be a translation of the Sanskrit marga/Pali magga. mleccha..........................Impure; used to refer to non-Aryan peoples, uncouth in their arya speech and negligent in their sacrificial observance. moksha..........................Release from this world of rebirth (in Buddhist terms, nirvana). monk’s basic requirements..A set of robes (traditionally made out of discarded cloth), a needle, a begging bowl, a belt, a razor for shaving their heads, a water strainer (to prevent the accidental ingestion of insects), and a walking staff. Namo tassa bhagavato arahato samma sambuddhassa..................Honor to the Blessed One, the Exalted One, the Fully-Enlightened One. Nidanakatha....................A later commentarial text. nigama..........................Settlements, local markets. nikaya...........................Long ‘chapters’ that make up the second of the Tripitaka collections, the Sutra Pitaka, and are largely concerned with issues of the dharma. nirvana.........................The absence of all states; literally means ‘to extinguish’. When asked once if nirvana were a state of existence or not, the Buddha responded that this was an unanswerable question, and left it at that. The point is that the focus should be on mindful progression on the path, not on the destination. pabajja...........................‘To go forth’, the Pali term for becoming a monk. paribhoga.......................Relics of use, such as bodhi trees, the bowl of the Buddha, etc. pasamda........................Any religious sect or philosophical school (Asokan edicts). pasanda.........................Sects in opposition to Brahmanism. Paumacaryam.................Jaina version of the Jatakas. pratityasamutpada..........Conditioned arising, often called ‘chain of becoming,’ which is broken into twelve links, and is one of the most important Buddhist doctrines. This is a more elaborate understanding of karma and samsara, a vision of cause and effect in which everything in the world is dependent on some other thing for its existence, and is succinctly expressed in this simple formula: “When this is, that is / That arising, that arises / When this is not, that is not / This ceasing, that ceases.” In other words, one thing begets another. Birth begets life, which begets decay, which begets death, which begets death, and around and around. To get out of the cycle, the chain must be broken somewhere, most efficiently at its weakest link, ignorance, which is done by applying oneself to mastering the dharma. pubbekatahetuvada.........The theory that every human experience is due to past action. raja...........................Chief, a term rich in potential for misunderstanding in that it later came to mean a king in the monarchical states and an elector, or a participant in government, in the republics. Suddhodana, Buddha’s father, was a raja in this latter sense. Ramayana..................Second of the great Sanskrit epics (Mahabharata is the first) may be seen as ‘an epic legitimizing the monarchical state.’ In its final form, that the Ramayana is later than the Mahabharata is shown by the prominence given to regions which are unheard of in the latter. Indeed, while the main wanderings of the exiled Pandavas seem to have been restricted to the immediate neighborhood of the Doab, those of Lord Rama and his associates are made to extend deep into central and southern India. No doubt much of this was a gloss by later redactors, but it is still precious evidence of the continuing spread of Aryanization during the first millennium BCE. If the Mahabharata hints at the pattern of settlement in the north and west, the Ramayana continues the story eastward. renunciation...............In order to attain equanimity of mind, which is necessary to remove the bonds of attachment that give rise to suffering, one must separate from society. This separation is called ‘renunciation’ in Buddhism. rta..........................One single, ordaining, sustaining, coordinating principle of which all known forces, laws, and movements are manifestations. Sabba-papassa akaranam, kusalassa upasampada, Sacitta-priyodapanam; etam buddhana sasanam.......To do no evil deeds, to give effect to good, To purify the heart; this is the Buddha’s teaching. samadhi...........................Meditation/trance—right effort, right mindfulness, right concentration. samsara...........................Underlying virtually all of Buddhism is the doctrine of samsara, which Buddhism shares with Hinduism. Samsara is really a fundamental worldview or ethos, and understanding of the world, which holds that all beings, including animals, are part of an endless (and beginningless) cycle of birth, life, death, and rebirth. Furthermore, Buddhism holds that the physical universe is made up of infinite world systems, spread out infinitely in space, and that these world systems, like the individual person, are also subject to the cycle of birth and rebirth. It was, in many ways, the realization of the horror of samsara that led to the Upanishads and the shramana movements—attempts to find a way out of this endless cycle of rebirth. samudaya..........................The second noble truth is the arising (samudaya) of suffering. sangha.............................The community and institution of monks. shila................................Effects—right action, right speech, right livelihood. shramana, sramana, samana.........Ascetics, renunciates. A diffuse group of religious seekers calling themselves shramanas began to reject the structural Vedic social and ritual world, and instead seek insight outside of society. They, like their Upanishadic counterparts—who, remember, were themselves Brahmins—sought out the quiet of the forest and the jungle, where they could debate philosophical and religious matters among themselves, and where they could gain knowledge of their own nature, and ultimately, of Brahman. And they felt that once they gained this understanding, they would be released from the world of samsara and would attain eternal oneness with Brahman. suddhavasa........................The first five realms of The Fine Material World (Rupa-Loka) are called the Pure Abodes. Sujata...............................Sujata offered Buddha a bowl of rice gruel, and with this modest nourishment Buddha sat down beneath a ficus tree, facing east, near the town of Gaya along the banks of the Phalgu River, and vowed not to rise until he had reached his goal of true enlightenment. Tathagata..........................‘Thus gone one,” the name Buddha gives himself, referring to his enlightened state. Tena samayena....Upali, disciple of the Buddha, began each account with tena samayena (the occasion was this). Theravada..........................The ‘doctrine of the elders”. Tripitaka............................Buddha’s teachings systematically organized into groups which were eventually gathered into three sets of what the tradition regards as Buddha’s actual words—although it is doubtful that any of the texts are not marked by embellishment. These are known collectively as the Tripitaka: the Discipline (Vinaya), Teachings (Sutra), and Advanced Doctrine (Abhidharma). Udraka Ramaputra...............Buddha first encountered two teachers, Alara Kalama and Udraka Ramaputra, from whom he received various spiritual insights and teachings…meditational techniques and basic yogic vocabulary consistent with that worked out in the Hindu Upanishads. From Udraka Ramaputra he perfected a meditational state called the ‘sphere of neither perception nor nonperception,’ a blissfully calm state of mental equipoise. Upali..................................An expert in monastic discipline (vinaya). Upanishad, Upanisad.............A group of orally transmitted texts that began to be composed in the last part of the Vedic period, from about the 8th through the 6th centuries BCE; culmination of human knowledge and understanding. Uttarapatha........................The Northern Route, extending from the Panjab and the upper Indus to Bihar and the lower Ganga; was the main axis of Aryanization and subsequently of Buddhist proselytization and even Magadhan imperialism. vamsanucarita....................The genealogy of all the known lineages and dynasties up to the mid-first millennium CE. varna...............................‘color,’ which is often taken to mean that the higher castes also considered themselves the fairer-skinned. This is now disputed. According to the Mahabharata the ‘colors’ associated with the four castes were white, red, yellow and black; they sound more like symbolic shades meted out by those category-conscious brahmanical minds than skin pigment. Vinaya Pitaka.....................The ‘basket’ of monastic rules and regulations. vis...................................Peasant who was member of a clan, the commonality. yajamana..........................He who has the sacrifice performed. Yasodhara.........................Buddha’s wife; also the name of Maya’s mother, (Buddha’s maternal grandmother). yathabhutam.....................A state of perpetual flux. Yavana, Yona.....................A word derived from a Persian spelling of ‘Ionian,’ but which could designate almost any people belonging to the lands west of the Indus who were alien to India’s traditions. Such people were also by definition mleccha (foreign and unable to speak properly), and hence casteless. But caste being assimilative as well as exclusive, they might, as overlords, aspire to the status of vratya ksatriya, or ‘degenerate’ ksatriya. Macedonians, Bactrians, Kushans, Scythians, and Arabs would all at some time be called Yavanas, and many would eventually be awarded the vratya caste status. Ye dharma hetuprabhavas tesam hetum Tathagata uvaca, tesam ca yo nirodha evam vadi mahasramanah (Sanskrit).................Whatever be the phenomena that arise from causes, the Tathagata has expounded their causation as well as their cessation. The great recluse is such as theorist. Yoni.................................is the Sanskrit word for female genitalia. Its counterpart is the lingam (as interpreted by some), the phallus. It is also the divine passage, womb or sacred temple (cf. lila). The word covers a range of meanings, including: place of birth, source, origin, spring, fountain, place of rest, repository, receptacle, seat, abode, home, lair, nest, stable.